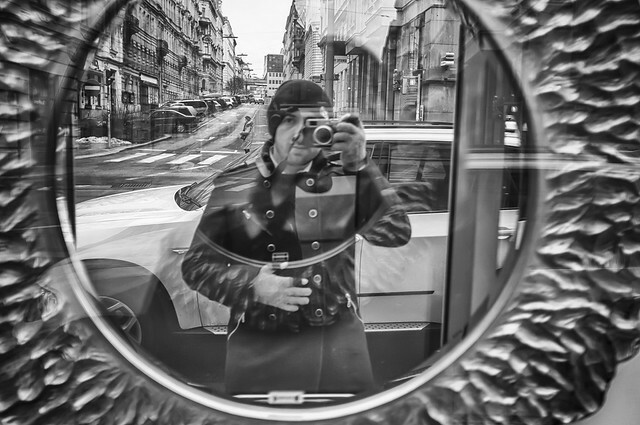 A few days ago I selected this picture for the 85mm.ch self portrait street self portrait contest, organized by Thomas Leuthard on flickr. For some strange reasons I love this picture. There’s me, but not in focus, wearing my favorite jacket and using my favorite camera. The focus is behind, on the cars parked on the side of the street. There’s me, in the center, but the center of the picture is on what’s happening behind: a car passing by. The picture is naturally round-framed by the mirror but the very border is blurry and smudged as a perfect contrast with the sharpness of the U6 line of the Vienna underground and the very end of the road. The retro feeling of the black and white process and the old buildings contrast so much with the modern car behind and with my X100 camera. All those contrasts are balancing eachother. That’s why I love this picture so much.